A disparate, siloed job scheduling environment can no longer handle today's enterprise workloads. Fragmented tools and processes are translating into high costs, inefficiencies, lengthy mean time to repair (MTTR), and an inability to prioritize actions based on business impact. The answer? 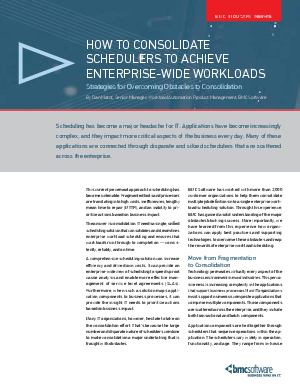 A single, unified solution that consolidates and streamlines enterprise workload scheduling and ensures that workloads run through to completion - consistently, reliably, and on time. Read more to learn just how valuable a consolidation effort can be. With a solid plan, a strong team, and the right tools, the move to consolidated enterprise workload automation is more manageable than you think.